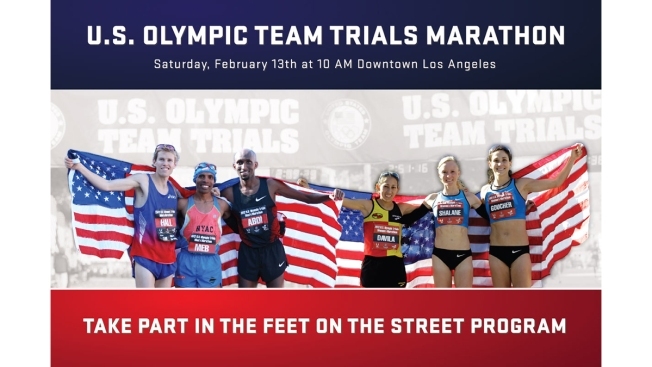 The U.S. Olympic Team Trials Marathon is scheduled for Feb. 13 in Los Angeles and you have a chance to cheer on the competitors vying for a spot on the team headed to Rio this summer. NBC4 Southern California will host the big event with long-time sportscaster, Fred Roggin, serving as master of ceremonies. Select a location on the course along the Figueroa Street Corridor that you would like to cheer from and sign up here by Feb. 10. Click here to view a course map. Rally friends, family, co-workers, school-mates and neighbors to join the fun. Email, call and text your team to get them to commit and get excited. Start planning. Decide how you will support the athletes to make them feel the LA Love. Get creative with signs, pom-poms, matching shirts, and lots of USA and LA spirit. It's up to you and your group how much you want to do. As long as you follow the guidelines, of course. Go out and cheer. The race is Saturday, Feb. 13 at 10 a.m. along a loop course, so you will see these elite athletes multiple times. Be sure to stay and cheer until at least 1 p.m.
Click here for details about the race, how runners qualify and more information about Feet on the Street.